Whether or not you’re wearing contact lenses, your eyes require moisture from healthy tears. Tears help protect your eyes by distributing essential oils and nutrients, eliminating waste, and providing sufficient lubrication to allow for comfortable blinking. The chemistry in your eye is exceedingly complex, but without a healthy balance your eyes will feel dry or painful and your vision may be compromised. Furthermore, when you introduce a foreign object into your eye, such as a contact lens, the natural chemistry is disrupted. To protect against any unwanted effects, such as dry eyes, lens fogging or protein deposits, contact lens manufacturers often treat or coat contacts to help improve how well they interact with your eye’s natural chemistry and functionality. The latest innovation in contact lens coatings is Tangible Hydra-PEG. Consider this: We blink up to 14,000 times every day. That’s a lot of potential contact lens friction that may lead to a decrease in lens comfort and wearing time. To reduce the potential effects of lens friction with contact lens wear, special lens coatings have been developed to improve lubricity and wettability. A contact lens’s lubricity determines how it moves on the eye and how the lids blink over the surface. Wettability is a measure of how well a lens allows a film of water to spread over its surface. Both of these factors relate to friction. It has long been the goal of those in the contact lens industry to find more effective ways to increase these attributes to improve lens comfort. It is out of such efforts that the Tangible Hydra-PEG coating, designed to improve lubricity and wettability, was born. Tangible Hydra-PEG (developed by Tangible Science) permanently bonds to the surface of a contact lens and inhibits the evaporation that causes so much discomfort. The polymer, polyethylene glycol (PEG), has been used in ocular lubricants for decades and is known to improve lens surface wettability, increase lubricity and reduce protein and lipid deposition on the lens., This optically-clear coating, which is composed of 90% water, encapsulates the contact lens with a hydrophilic shell. People who currently experience ocular dryness or discomfort associated with contact lens wear may benefit from the Tangible Hydra-PEG technology. Starting in 2017, Tangible Hydra-PEG is available on Duette hybrid lenses in the US. 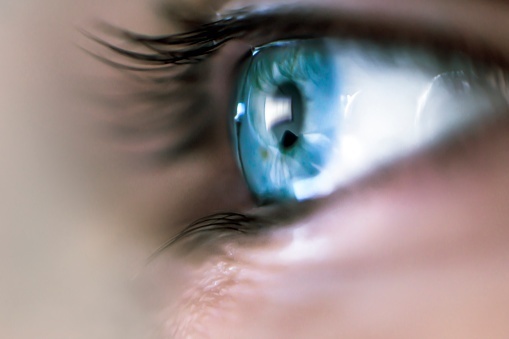 Up to half of contact lens wearers experience contact lens discomfort with some frequency or magnitude, but this breakthrough polymer coating offers new hope. Tangible Hydra-PEG is a promising technology that should serve to significantly improve the contact lens-wearing experience. In fact, during a pre-launch program, 141 patients were fit with Duette lenses coated with Tangible Hydra-PEG and the feedback was overwhelmingly positive, with patients and doctors citing great optics and all-day comfort. One small tip: the attributes that make Duette with Tangible Hydra-PEG more lubricious for increased comfort also can make the lens surface a little more “slippery,” so it can take some getting used to in terms of inserting and removing the lens. However, with a little practice and very dry fingers for each removal, you should quickly master how to handle these comfortable lenses. SynergEyes is the only advanced-technology specialty contact lens company focused exclusively on the leading independent eye care professionals. The SynergEyes portfolio of proven products support the specialty contact lens continuum, and include Duette® and Duette Progressive hybrid lenses for astigmatism and presbyopia, and UltraHealth® hybrid lenses for irregular corneas, all available with the Tangible Hydra-PEG coating. The SynergEyes portfolio also includes the SynergEyes VSTMscleral lens for more challenging corneal conditions, advanced technology corneal RGP designs and legendary hybrid designs in ClearKone®, SynergEyes® A, MF, KC, and PS. The SimplifEyes 1Day daily disposable lens enhanced with Dual Tangible Polymers is the most recent addition to the SynergEyes portfolio. Tonge S, Jones L, Goodal S. The ex-vivo wettability of soft contact lenses. Curr Eye Res. 2001;23:51-9. Sindt CW. Does Lubricity = Biocompatibility?. Review of Cornea and Contact Lenses. June 2013. Coles CML, Brennan NA. Coefficient of friction and soft contact lens comfort. American Academy of Optometry. 2012; E-abstract 125603. Carney, LG; Hill, RM. The Nature of Normal Blinking Patterns. Acta Ophthalmologica. 1982;(60):427-433. George W. Ousler, Clifford Michaelson, Mike T. Christensen; An Evaluation of Tear Film Breakup Time Extension and Ocular Protection Index Scores Among Three Marketed Lubricant Eye Drops. Cornea 2007;26(8):949-952. Desmond Fonn; The Clinical Relevance of Contact Lens Lubricity. Contact Lens Spectrum 2013;28(13)25−27. Lyndon Jones, Noel A. Brennan, Jose Gonzalez-Meijome, John Lally, Carole Maldonado-Codina, Tannin A. Schmidt, Lakshman Subbaraman, Graeme Young, Jason J. Nichols. The TFOS International Workshop on Contact Lens Discomfort: Report of the Contact Lens Materials, Design, and Care Subcommittee. Invest. Ophthalmol. Vis. Sci. 2013;54(11) TFOS37−70). Sindt CW. Tangible Hydra-PEG: A Novel Custom Contact Lens Coating Technology Designed to Improve Patient Comfort and Satisfaction. Whitepaper. 2016. Available at http://www.tangiblescience.com/tangible-hydra-peg-white-paper-down. Nichols JJ, Willcox MD, Bron AJ, Belmonte C, Ciolino JB, Craig JP, Dogru M, Foulks GN, Jones L, Nelson JD, Nichols KK, Purslow C, Schaumberg DA,Stapleton F, Sullivan DA; members of The TFOS International Workshop on Contact Lens Discomfort. The TFOS International Workshop on Contact Lens Discomfort: executive summary. Invest Ophthalmol Vis Sci. 2013 Oct 18;54(11):TFOS7−TFOS13.